Let’s go straight to the point. The case in front of you is an example of box for souls. Its 5.8’’ size makes it pretty handy and perfect to be contained inside a custody with alarm integrated system. You will keep your soul inside this small box, so first you have to keep it from being stolen. Second, it could happen a rejection of it, so you must be very careful with it. My box’s alias is A., which is also the name of my father. This makes me sure that it’s not gonna be rejected by my body. 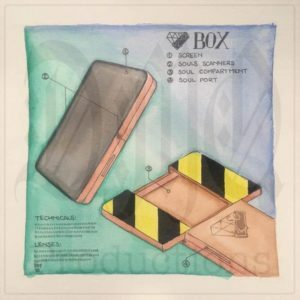 Crucial is the choice of the material you want your box made of. It can be wood, any metal or even a stone. Anyways, you’ll have a better idea about your soul’s box after the lessons of professor F. from the Department of Philosophy of Mind and Building Materials. By now, let’s stick to techniques of discovering and imprisoning a soul and how to give it a value. First of all you must familiarise with your device. Keep it always with you, even better if you keep it in you hand without any reason. Get distracted from conversations with your friends or relatives, no one will get offended, I assure you. Stare your box as long as you can, keep your eyes fixed on its black surface. After sometimes you will feel that you cannot stay without it anymore. That’s exactly what you need to do, when you, your dispositive and your souls merge all together. Anyways the system is simple. I switch on a white light and I calibre it. The more the difference with the pure light, the less the carats, and here is the real value of the light of your soul. Obviously it’s not all here, but it’s pretty much all about it, people fall in love with the light of their souls. Don’t worry at all, I can tell you it’s all about experience. As a result, the value will be included between black (zero) and pure white (5). In my whole life I saw only once a soul arriving to pure white, the soul of an actor. I think you are aware of this artists, how little they know about the world and how much light they can store that way. We, simple working souls, are not entitled to do that. We must work hard everyday, get our shirt dirty in order to have our souls back. But we are really without a soul? at this point the audience understand the situation. It’s almost over, so they need to clap their hands or laugh. In the sales world it is how it works. A smile is not there to convey emotions, but it’s just a mere parenthesis between sales, mute answers to questions no one ever asked, just to feel that emptiness more human. In that room full of hardened chewing gum, teeth bleached by coffee and elderly thighs eyed by eyes with ties, the day was almost over. The sun, unaware or maybe conscious of everything, pulls the chord to say goodbye, disappearing with a smile behind the mountains of concrete burned by city lights. Only about one or two, maybe, will be strong enough to be dealers of souls. Maybe? How comes, you are thinking right now, my role is to give you some certainty and then I reduce everything to an odd maybe? Yes, it doesn’t depend completely on us. We’re going to do our part, but then it will be up to you and it will be the most difficult part. In the long run your soul knows what is better for you. I had extraordinary students that in the moment they have to separate from their souls, they discovered unknown parts of themselves. They quit a career that could lead them here, now in front of you as your professors, to help unknown people. Some of them went to help the poor, others the sick or the drug addicted. Their souls were obviously not ready yet to aspire to the top. The career is difficult, but well articulated. From apprentice dealer to senior dealer, then to broker up to governor. Governor! Just imagine for a second the face of your mother the day you will go to tell her you are governors. When you will have enough money to buy any soul you want. When people will bow in front of you in the street, asking for help and kissing your hand. Your hand! But only your soul knows what is better for you, so choose your soul wisely. Whom among you already sold his soul has an advantage, that’s true. Second or third hand souls, better if dealer souls before, are more flexible. We will try together to transmigrate your soul into the device, so we will be able to start for real. In forty years from now, when you will stop working and you will start taking your soul in your hand again, you will rethink about this exact day and how much work you’ve done in order to free yourself. From my personal experience, I know some of you that don’t feel anything for their vital force. This people will start selling their spirit for a new one. After forty years selling souls, you will notice it will be difficult stop selling souls all at once. You will never fill your soul right. I give you an advice. The exercise everyday will start being more and more difficult, don’t try to cheat. Fix the problems in the moment and stop if you don’t feel completely at ease. A small problem today will be one day a bug or another programming problem and you will start all the exams, risking to loose your own soul for nothing. Start working on your ego. This is what your soul, your dealer soul, is craving for. The pic is great, the story so unusual. Please go on!